It’s all a bit messy really. The word ‘Chip's’ is the dominant feature (we won't even get into the use of the apostrophe). Yet there is a small Barcel logo in the corner. This is odd – a logo incorporating the word Chips is an industry standard and surely a more acceptable brand building image. The photograph in the background is fantastic - It features Chips and the main ingredient, plus a flavor color coded potato sack. 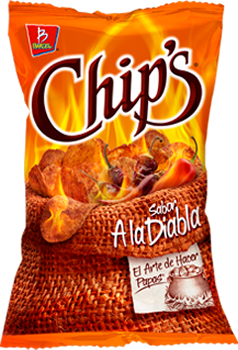 Unfortunately, while this would look good as a standalone photo (especially the burning Chilis and Limes in their respective flavors), it doesn’t really work as Potato Chips packaging. The flavor is in a hand-written style in white and looks a little lost, which is a shame. Overall, it all just tries a little bit too hard and in the end the redeeming feature; the word ‘Chips’ to say what the packaging has inside, is the major design fault! These thickly cut and oil stiffened Chips featured a hard and firm crunch that while not brittle, did have a sustained snappy munch throughout the eating process. When you think of Potato Chips and Crisps you might consider a pale yellow potato color. Not these. These Chips were dark red, orange, brown even, in color. They looked hardened by oil. The glistening oil boils bursting to greet every mouthful. As it says on the bag; they looked like we were about to Taste the Devil. A Nose Plunge Test revealed a firm reminder of Paprika. The taste was hot and spicy, as we expected. There was a tomato background that was aided by a citrus and peppery kick. They were perhaps not as hot as we presumed they would be, but the odd fleck of dust left behind certainly raised a cough or two.